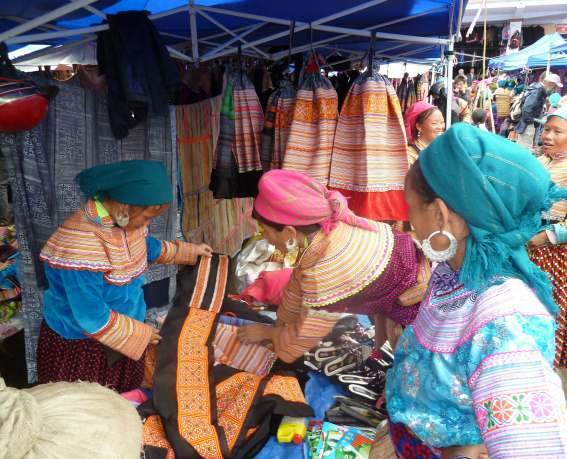 Traditional clothing styles continues to be worn by women throughout the region and in some areas it grows more elaborate with time as the Hmong struggle to retain their identity in modern society. Access to ready made synthetic embellishments bought cheaply at the market are in some respects aiding this as a change in the village dress style can now be quickly and easily integrated into every womens dress style. In the past where clothing was exclusively made and embellished by hand meant that styles were not a varied as they are today. Whilst hemp fabric is still used today there is unfortunately an increased use of synthetic fabrics and electro pleated ready made skirts and western t-shirts being worn for day to day use. The elaborate hand decoration on skirts and jackets is slowly being replaced by mass produced machine embroidered pieces. The use of traditional hemp outfits is increasingly only being seen worn by the older women of the village or for special occasions. The Hmong men all tend to wear western dress these days with the exception of some villages where you will still see the older men dressed in plain black pants and jackets. The Black Hmong costume is predominantly black or dark navy in colour. An indigo batik skirt and shirt with embroidered rings on the sleeves are usually only worn by young girls up to the age of puberty at which point they are replaced by an above the knee black skirt with black leg warmers and a plain black jacket with a thin red or white border. A long black waistcoat bordered in white and red is worn over the jacket and tied at the waist; below the waist it forms a front and back apron. Their hair is usually tied in a bun and a black circular hat with a hole at its centre place over it although some have opted to wear a bright checked scarf similar to the Flower Hmong. The Black Hmong are found mainly in the area around Sapa. Many of the villages continue to use traditional hemp fabric fabrics as opposed to the Flower Hmong who are opting for more and more synthetic fabrics. 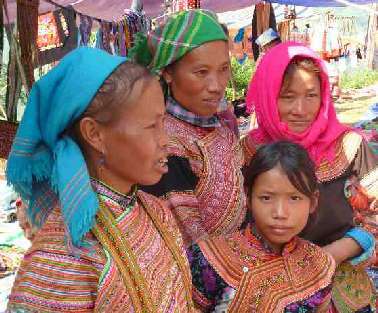 There are many different clans of the Flower Hmong or Hmong Hoa across North West Vietnam. Costumes vary from village to village. The groups of these Hmong are often named by the predominate colour in their costumes. For example Blue , Green or Red Hmong. The Flower Hmong from Mai Chau up to Dien Ben Phu wear less elaborate costumes than other Flower Hmong clans seen further north. 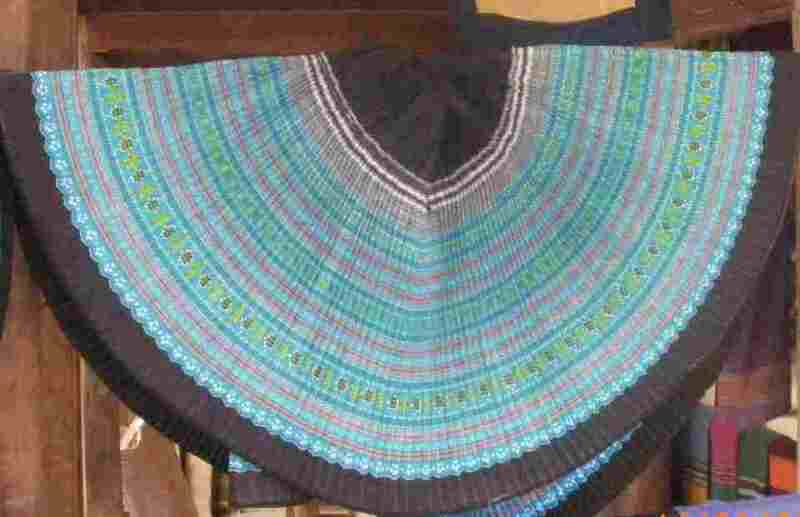 They are often called the blue or green Hmong as many villages use predominately blue colours to embellish their outfits. They wear a dark skirt with blue decoration around the bottom of the skirt and a black apron. A black jacket with embroidered rings around the bottom of the sleeves and black leg warmers complete their outfits. Their hair is generally plaited and wound around their head. As is the case in many villages these days the indigo dyed skirts are now only worn by the older women or on special occasions, most opt for a synthetic pleated skirt. and their jackets for everyday wear are usually made black from polyester. There are some villages that combined the synthetic skirts and jackets with panels of hand embroidery. 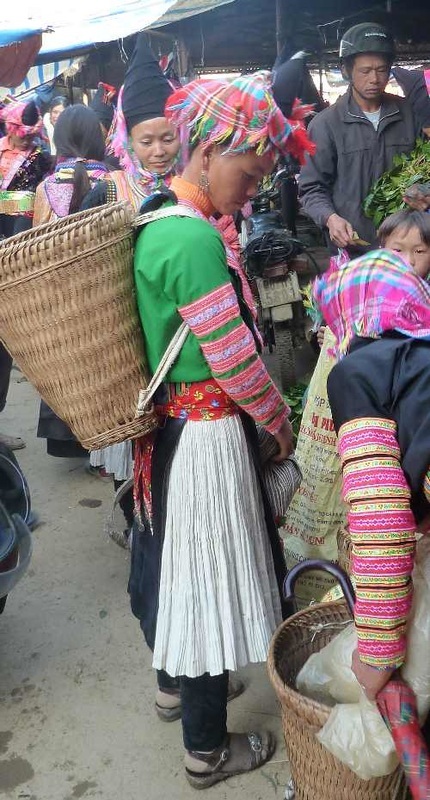 The Flower Hmong in the areas from Dien Ben Phu through to Sapa generally wear an indigo pleated skirt and a black apron with a dark jacket with embroidery at the cuffs and upper arms and an embroidered back collar or panel. The predominant colour of the decoration on their outfits is red, hence they are often known as the Red Hmong. They usually tie their hair high around their heads and secure it with a chequered band or patterned headscarf. As you get closer to the area around Sinho the women tend to wear pleated indigo skirts that are richly embroidered and teamed with a black apron with red and floral bands along with a black jacket with large embroidered panels at the front and circles of blue and floral around the lower sleeves. There is also a number Red Hmong in this area who are instantly recognised by their unique "big-hair" styles. These women collect dead hair (sometimes from family members too) and weave it into their own hair. There are also some who weave red wool into their 'big hair. Some of the villages also wear a plain black skirt with a bright coloured jacket with pattered borders and large panels of embroidery on the upper arms, others wear indigo embroidered skirts with a black apron and a floral scarf. Again many women are opting for synthetic pleated skirts and polyester jackets with some hand embroidered panels. The traditional clothing of the Flower Hmong in the area from Sinho to Sapa and onto Lao Cai province is one of the most colourful of all the Flower Hmong. The women of the area wear highly colourful calf length embroidered skirts teamed with a brightly coloured jacket (each village has a different colour) which is decorated by a broad embroidered collar and panels of embroidery on the lower sleeves. The outfit is usually worn with a small embroidered front and back apron along with embroidered leg warmers and a plain or patterned scarf. The White Hmong used to wear plain white hemp skirts until Ho Chi Minh decreed that they were not practical so women generally stopped wearing them. Generally they now wear black trousers with a black apron bordered in red with a floral waistband together with a black jacket with decorated lapels and concentric circles in blue around the lower sleeves. Some women can also be seen wearing black headscarves with bright red or pink tassels. 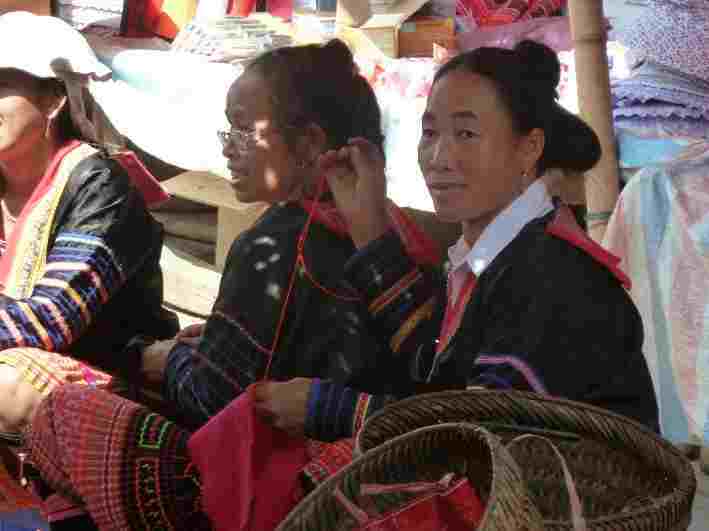 There are still a few villages in the area around Muong Te and Sinho where the women still wear the traditional plain white skirts teamed with a black aprons. 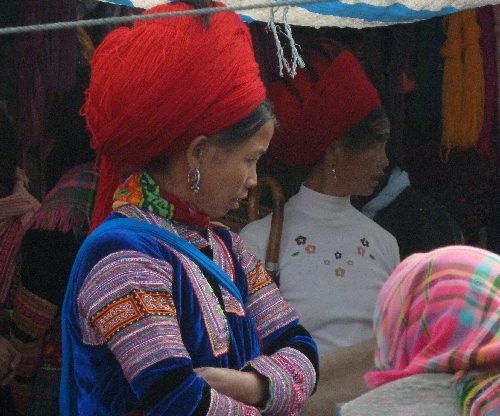 Some of the White Hmong around Sinho also wear tall black peaked turbans with a small patterned scarf attached which is sometimes tied under the chin.